We enjoyed this tasty rice pudding over the weekend. 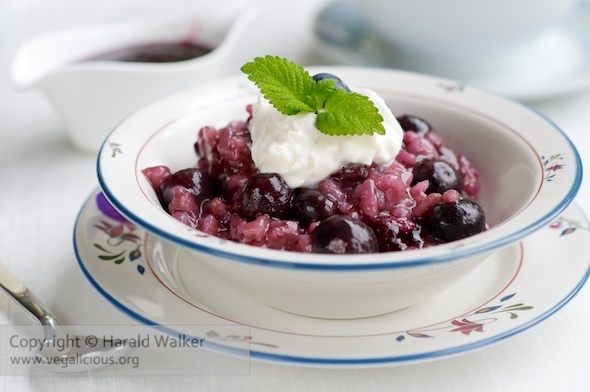 I had never thought about doing blueberry rice pudding but it was delicious. We added quite a bit of cinnamon, as we find it nice with blueberies, also nice with rice pudding. We used a bit of Soyatoo on top, but did not need any blueberry sauce. Posted by Chris Walker on May 30, 2011 in Blueberries, Reviews, Rice. Support us by licensing our vegan food photos from one of the following stock photo agencies.